Discussion in 'Ride Reports - Epic Rides' started by flyingdutchman177, Feb 21, 2019. Finding gas in Laos is easy. There are gas stations every few miles on the main roads. And even gas stations in the smallest of towns. But in the smaller villages, they sell the gas out of one liter bottles brought in from the nearest town. I wasn't exactly running on empty, but I decided to stop and put a liter in just in case. The self service was a nice touch. HiJincs, Seba1, RiderRick and 19 others like this. Ed, i gotta say - your demeanour is truly impressive in these videos. you are a shining star. OldPete, shuswap1, flyingdutchman177 and 1 other person like this. This is where I slept my first night in Laos. It was getting late and I needed to find a place to sleep. 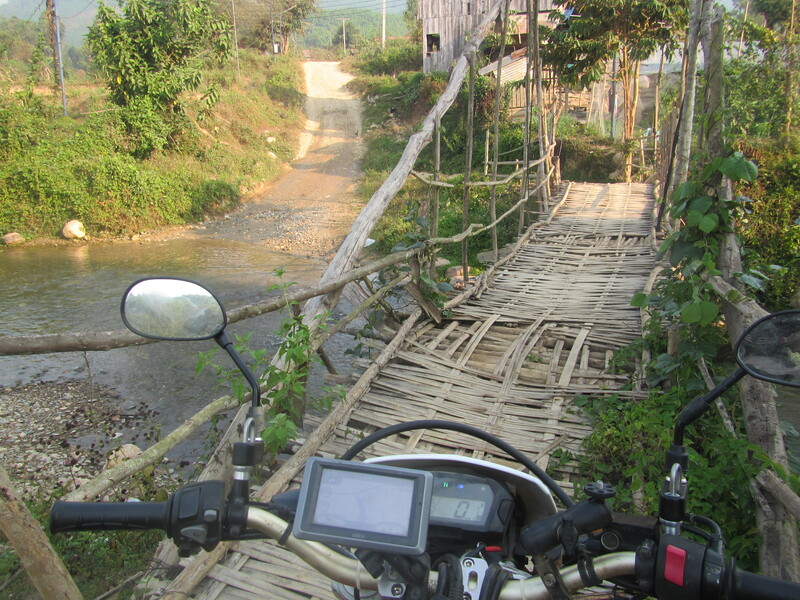 I had been riding along a road/trail the parallels the Mekong River. I noticed this place and made a mental note of it. On my GPS, I saw a some town up ahead about 4 miles where I was hoping to find some food. I rode into the village and found one restaurant (well it seemed like a restaurant) but the woman just waved me away. So I headed back up the street and looked more carefully and found another place where I could eat some noodle soup. After dinner, I rode back to the place I found on the Mekong and called it my home for the night. Price was right. The view was spectacular. And I slept well. What more could I ask for? I am not posting all my videos on Advrider. So come see them all if you are interested in seeing more on my FB page. td63, powderzone, Force0321 and 16 others like this. Ed, speaking of bugs...what's your worst bug bite so far. Hope you never had one of those bot fly deposits. Saw a video of a woman that had about five of those big larvae tweezed out of her upper arm! I had a tick once where you would least want it! The mosquito that gave me malaria in West Africa. VisionPilot and 95Monster like this. Pretty much every bridge like this is a toll bridge. You are free to cross the water if you can make it. But most water crossings, someone has built a bridge of very marginal quality. I usually opt for the bridge because I dont like getting my boots wet. Plus they are more fun. mb300, edgeoftheworld, shuswap1 and 22 others like this. This is one of my favorite videos. If it doesn't make you smile, then you must be having a really bad day. 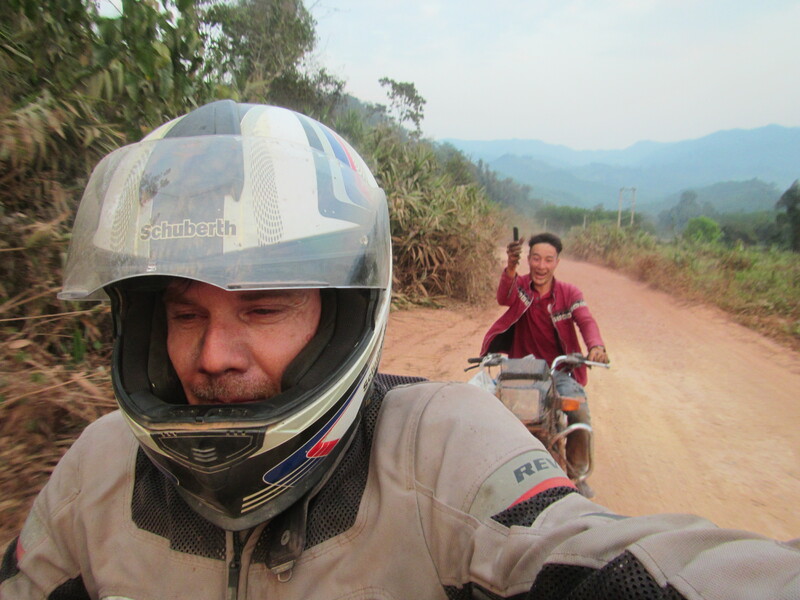 It gives you an idea of the reaction I get when I ride thru these small villages in Northern Laos. BruceT, HiJincs, h0lger and 21 others like this. Gasoline Gal's Momma keeping an eye on you! shuswap1 and flyingdutchman177 like this. Hey Ed. Just found you again during a sleepless night in Georgia. Like so many others I'm glad you are doing your thing again. Be safe. Hmmmm. News to me. Where's my tinfoil hat? 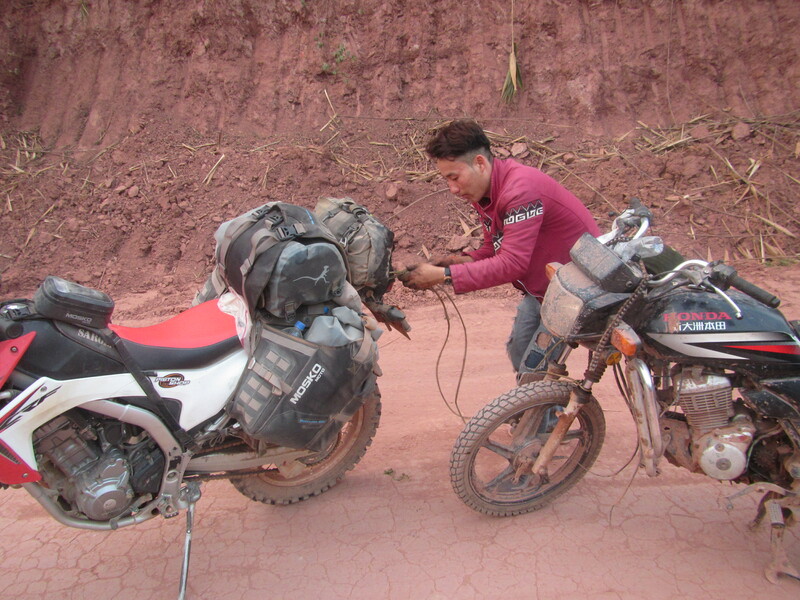 While riding thru a remote part of Northern Laos, I was flagged down by ths guy with a brooken chain on his motorcycle. I stopped and helped him out with some tools and parts to get him back on the road. Unfortunately, the safety wire and zip ties didn't hold his chain together and he didn't get very far. I couldn't just leave him there so we went into the jungle, pulled out some heavy duty vines and formed a rope. We tied one end to my bike and the other end to his. I towed him all the back to his village in the opposite direction so he was safely home. It was nearly dark by that point, which made it more difficult for me to find a place to sleep. But in the end, helping the guy out was the right thing to do. And if I was ever in the same position, I would hope someone would help me (I do carry with me a spare chain, 2 master links, chain breaker and chain lube, so being prepared is also important because good karma only goes so far). kevdawg, shuswap1, Spicciani2 and 21 others like this. Ed....you MacGyver'd a way to get the guy home and he didn't offer you dinner and a place to sleep? No worries, though, you just carry on. Cool. mb300, shuswap1, VisionPilot and 3 others like this. Looks like mission accomplished so far, staying focused on the ride, and not a two legged Edventure. Not that's there anything wrong with that. But if you want to look Joop back up, we support your decision...Great videos, and thanks for taking us along! Unexpected stories like this one is what I cherish the most from travels... One can plan where to go, what to see, where to sleep, what to eat... But the spontaneous aspect of a trip is what makes it alluring to me. shuswap1, VisionPilot and Burro driver like this. This whole trip was spontaneous. I flew in, got my bike, sat down with my maps and came up with a rough plan. I didnt know where I would wind up each day or where I would go exactly. I just sat out each morning to visit some places to achieve some personal goal. And what happened in between just sort of flowed. So many people plan their vacation to the extent that the only thing that is really gained are photos of them in images that are already engrained in their minds. shuswap1, VisionPilot, kumatae and 9 others like this. mb300, #1Fan, BillUA and 5 others like this. I recall traveling as a child pulling our trailer. This one time my mother announced at noon we'd stop for tuna sandwiches. My dad said, "what if we feel like hot dogs?". Mom said, "we'll feel like hot dogs on Thursday". That was the home I grew up in. mb300, Tomaso, HiJincs and 4 others like this.